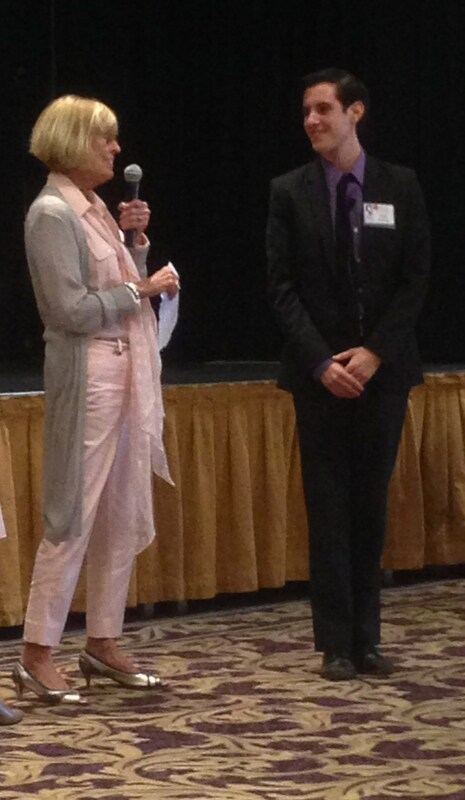 September 2014: Peninsula High and Chadwick are Picked to Perform in Scotland! 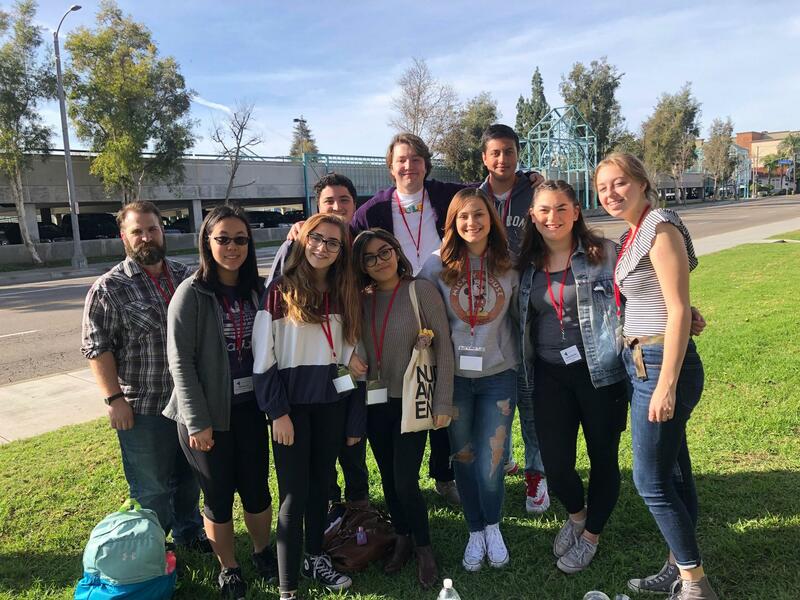 Kudos to the Peninsula High Drama students that attended the California Educational Theatre Associations' Southern High School Theater Festival in Fullerton. The three day weekend festival offers a variety of events for theater students from all over California including workshops led by professionals in the industry. Students enjoyed several performances and took advantage of the wide variety of theater opportunities. Congratulations to Peninsula High senior, Rachel Edelstein on earning one of five senior scholarships awarded during the weekend among 96 auditioners. Peninsula Drama also earned 2nd place in the Film Trailer competition for their entry from She Kills Monsters (Produced by Chloe Green, Sydney Miller & Kaito Suzuki). 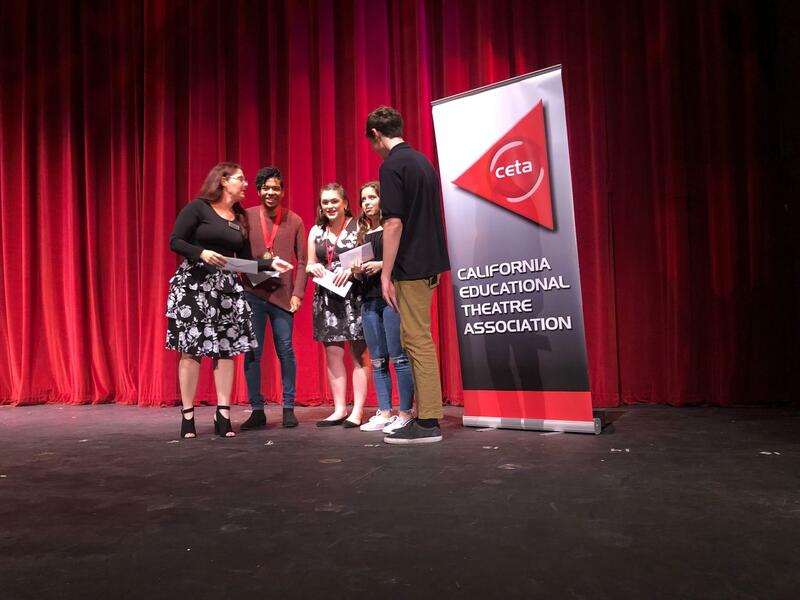 This past weekend wrapped up a successful Fall competition season for Peninsula Drama where they entered the Drama Teacher’s Association of Southern California’s (DTASC) 77th Annual Fall Festival. 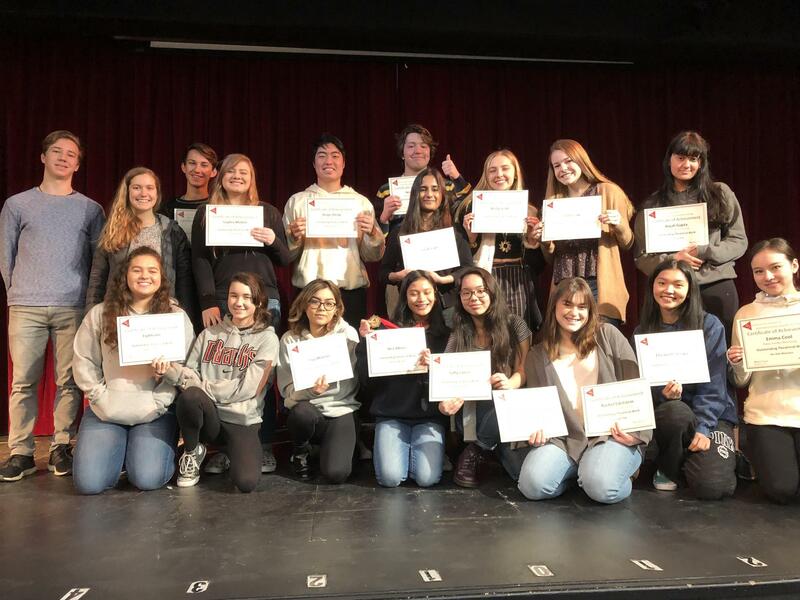 At the DTASC Varsity Division, competing against 67 other high schools, Peninsula Drama’s Drama 3/4 Advanced students reached the semi-finals in all acting categories. Our lone finalist entry, Rachel Edelstein, earned 5th place out of 101 entries in the Audition Monologue category . All of that individual and group success added up as Peninsula High School took home 1st place in Sweepstakes, based on points accumulated in all categories throughout the day. Congratulations to our competitors at both divisions. On Saturday, April 22, 2017 our Drama I and Drama 3/4 Advanced classes competed in the Drama Teacher’s Association of Southern California’s (DTASC) 97th Spring Shakespeare Festival. In the Junior Varsity Division, PVPHS reached semifinals in Modern Adaptation (Aina Williams & Hasti Zahedian, directed by Ashley Zoeckler). Honorable Mention was earned by finalists in Audition Monologue (Atina Hamidi, directed by Lauryn Williams) Audition Monologue (Maddie Ness, directed by Lauryn Williams), Shakespeare Uncut (Blue Martinez, Arista Mozena, Kat Neumann, Bella Zuniga, Directed by Autumn Rinck) and Large Group Comedy - A Midsummer Night’s Dream (Emma Cool, Anjali Gupta, Sarah Snow & Maili Tom, Directed by Julianna Yonis & Kara Zupanovich) 5th Place for Theme Collage (Sarah Adams, Amada Kalaydjian, Miles Muir & Kaito Suzuki, directed by Alyssa Condon and Trevor Rinzler). PVPHS earned first place in Large Group Drama - Richard III (Leila Bahraini, Elissa Luce, Ley’ah McClain & Angelica Moreno ,directed by Courtlyn Foster & Alexa Jones). At the Varsity Division, Audition Monologists Austin Kelly and Joshua Medina reached the Semifinals, as well as Large Group Comedy - A Midsummer Night’s Dream (Gabriella Campbell, Naomi Drayton, Sophia Goodin, Samantha Herrmann, Trevor Rinzler & Ashley Zoeckler, directed by Lexie Jones). Pen earned Honorable Mention for Shakespeare Uncut (Madison Hermon & Lauryn Williams, Directed by Austin Kelly), 5th place in the Shakespeare’s Contemporaries category (Natalia Achatz, Sophie Jacobs, Isabella Navarro & Kara Zupanovich) & 4th place for Large Group Drama - Richard III (Lucas Grenda, Erika Placer, Julianna Yonis & Elise Zimmerman, directed by Courtlyn Foster). Junior Alexa Jones earned first place for her Costume Design for Richard III in the Technical Theatre: Character Costume category. PVPHS earned Honorable Mention in Sweepstakes for both Varsity and Junior Varsity divisions for finishing in the top 10 overall among all competing schools. Visit our Vimeo page to see some the Varsity and Junior Varsity performances. . .
On October 28, students in Drama 3/4 Advanced competed at the Drama Teachers Association of Southern California Fall Varsity Festival. Competing against 82 schools at Calabasas High School, Peninsula Drama reached the Semifinal round in Student Original (Bea Albino, Courtney Barber, Sophia Molino, Julia Warrick; Directed by Lauryn Williams) and Large Group Comedy (Liam Goodin, Jae Hwang, Sofia Molina, Elizabeth Ozawa, Noah Shafer, directed by Isabella Navarro). Finalists included Honorable Mention for Technical Theatre - Costume Design (Leila Bahrami, Arista Mozena & Katarina Neumann); 4th Place in Set/Light Design (Blue Martinez, Ley’ah McClain-Perez, Angelica Moreno, Maddie Ness & Isabella Zuniga) and Audition Monologue (Rachel Edelstein; directed by Chloe Albino & Kara Zupanovich). PVPHS Received two first place finishes: Graphics & Publicity Design (Emma Cool, Sarah Snow & Hasti Zahedian) and Lauryn Williams finished 1st out of 98 competitors in the Audition Monologue category (directed by Chloe Albino & Kara Zupanovich). All this success earned PVPHS 9th place overall out of 75 competing schools. The Drama Department was competing again, this time with the Drama I Advanced class at the Junior Varsity DTASC competition on November 4. This time around, all of our entrants made their way to the final round. Honorable Mention went to Audition Monologue (Sophia Daniel,; Directed by Kara Zupanovich), Leading Ladies (Sarina Bacich, Lilly Odhner & Brianna YI; Directed by Lexie Jones and Tess Rivera), Horror/Thriller (Rachel Crawford, Katherine Lews & Thomas Evans; Directed by Autumn Rinck & Ayron Shin), Large Group Comedic (Annika Daniel, Francesca Genato, Kat Kugler, Leili Rose Mohammadi & Zeke Glavas; Directed by Shioka Chetanna, Sophia Molino & Diego Sheng) and Open Musical (Kevin Riley, Quinn Sullivan, Jacob Wong & Kylie Young; Directed by Erin Walker & Elise Zimmerman). Our 9th graders also earned 5th Place in Large Group Dramatic (Macey Caron, Anneliese Espinosa, Shanna Ziobro; Directed by Chloe Albino, Lucas Grenda & Samantha Herrmann); and 3rd Place for Student Original (Jordan Cherry & Zoe O’Neill; Directed by Natalia Achatz, Alexa Jones & Saffy Laurio). Overall, Peninsula Drama scored a 5th place finish out of 27 schools in Sweepstakes. 12th grader Ryan Axberg (Igor in the Spring Musical Young Frankenstein) was chosen as one five recipients of the Musical Theatre West annual Footlighters scholarships. Ryan and the other scholarship winners were honored on Saturday, March 21 at MTW's 'Music in the Morning' event which featured performances by all the scholarship winners. In all, Musical Theatre West selected 10 outstanding high school juniors and seniors out of 43 applicants from all over Southern California. On March 17, 2015, over two hundred Theatre students, theatre educators and administrators from schools all over California gathered at the state capitol to breakfast with legislators and legislative aides. During the past twelve years over two thousand students and teachers have participated in this statewide event. Brianna, along with prize-winning Theatre students were invited to perform at the California Department of Health during the 18th Annual CYIT. Brianna earned her invitation based upon her senior scholarship auditions at January’s CETA Theatre Festival. 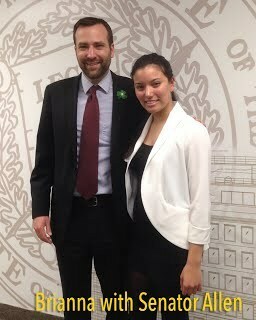 Brianna and Mr. Cohen met with our local legislators, Assembly-member David Hadley and Senator Ben Allen, in addition to her performance at the event. And spoke with them about the importance of arts in education and government’s need to continue to support the arts and education as a whole. Congratulations Brianna! WHERE DO OUR DRAMA STUDENTS GO WHEN THEY LEAVE PEN HIGH?